I’ll start this blog with something of a confession, because, as they say, confession is good for the soul. I love reading picture books just as much as I love reading Kafka or Dickens. And therein lies the conflict. Although I’m now a writer and editor, I spent most of my working life as a teacher, for the final ten years leading English in a school and training Primary school teachers to teach the subject rigorously and with passion. I mostly failed, I think, with the passion bit and here’s why. We live in a world where the written word is enshrined as an end goal, where word writers are put on pedestals and our education system is relentlessly geared to the mastery of words as some sort of Holy Grail. I tried to broaden the definition of ‘read’ and it met with deafening disapproval. I mostly taught at the top end of Key Stage 2 (9-11 year olds), by which time the majority of pupils could, of course, read fluently. When I (naively as it turned out) introduced a complex picture book into the curriculum (Roberto Innocenti and Ian McEwan's Rose Blanche) several children refused to look at a picture book which was ‘just for babies’. Then the parents joined in the fray. How would their children get Level 5 SATs/A* GCSE English/a place at Oxbridge by reading baby books? What on earth was I thinking? Didn’t I realise how important it was to introduce them to the canon of classic literature as early as possible (preferably in utero) in order to gain advantage? I define reading much more widely than just the written word and nothing in my experience has yet convinced me otherwise. Babies and toddlers can read gesture and body language fluently; it follows that they can also read image just as effectively. So although the traditional view is that pictures exist in books to entertain toddlers, introduce them to the concept of a book and then clue early readers into text, my view is that this is too limiting a definition of the role of image. I think it can be read as a medium in its own right and therefore is not something that we should train children out of as print starts to predominate. As the war comes to an end, Rose stumbles through the forest in thick fog. On the opposing page, a frightened German soldier fires into the fog. In the final image, a flower which she had picked lies dead over a barbed wire fence. On a mound below the fence, new flowers blossom. These final images provoked really intense discussion. If I had ever needed persuading about the power of image in developing skills in inference and deduction, it would have been this experience that would have persuaded. Some children decided that Rose had abandoned the flower, found her Mum and lived happily ever after. Some children read into the image that she had been shot by the soldier even though she was also German, the mound being her grave. All children discussed new life and its continuation even after the Holocaust. And only image can provide children with the opportunity to discuss intense, emotional issues from within their own understanding. Words have to spell it out too clearly to afford the opportunity for much interpretation. Could ten-year-olds have gained such an in-depth understanding of such a difficult issue from a print book? 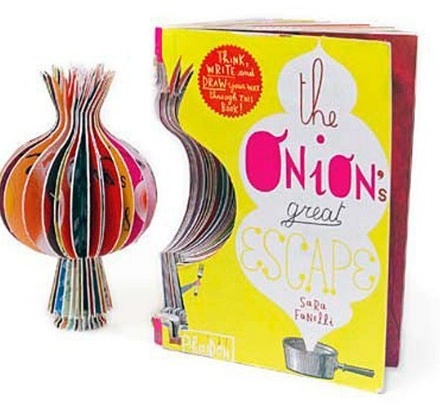 And finally, Sara Fanelli's The Onion’s Great Escape – an amazingly powerful book which engages the reader in philosophical thinking at really deep levels. In case you’ve never read Sara’s books, you tend to form relationships with them rather than read them. This book is part poetry, part narrative and part philosophy. You also create your own new book as you release an onion from confinement. If you want to encourage children to challenge conformity and tradition, this is the book to share with them. Sara’s work is typified by collage, a medium which she loves and which she feels that children engage with quite naturally. I spent hours when I first read this book gazing at the different collage materials, going off on thought tracks of my own. Then there are the scribbles which you can imagine to be anything... a very personal, visual experience. I haven’t read this book with anyone yet because releasing the onion will be a very special moment, for which I am waiting for a very special child. So, words, who needs ‘em? Well, we all do, of course. I’m not arguing for the abandonment of word books, merely an expansion of parental vision to allow for the enrichment of children’s reading experiences. But with the relentless, narrow view of reading and its mastery, which is the Emperor’s current new clothes, I don’t see it coming any time soon. Thank you, Gill. This is a fascinating blog and I have ordered the books you mention. Given that children are given image-led books from such an early age it seems obvious that they would respond strongly all their lives, and for many children who find reading difficult imagery would be the way into a story. Besides which, children in the twenty-first century are surrounded by imagery and know how to decode it very well. And yet it seems that this powerful creative learning tool is being rejected by curriculum-makers. So thank you for giving us some examples we can pass on to parents and older children to try. Thank you for inviting me to guest blog, Moira. What always knocks my socks off when sharing image dominated books with children is the maturity and depth of their thinking, which they articulate very effectively when freed from the need to write their thoughts down or decode print. Thank you for such an inspiring post. It always feels strange to me that older children will read comic books without embarassment, yet shy away from complex picture books like the ones you mention. There is a clear cross over between complex picture books, comics and graphic novels such as Raymond Brigg's wonderful 'When the Wind Blows'. How disappointing to hear the parental response you describe above! Hi, Abie. I;m glad you found the post inspiring - I was delighted to have the opportunity to write about the role of image. The ironic thing about the parental response I experienced is that my own daughter, who devoured picture and print books with equal enthusiasm throughout her childhood, was not only academically successful but is also now an outstanding English teacher, with the same love of active learning, image and film as me. That pretty much proves my point, I think. I couldn't agree more. I feel really sad when I see children being told they're too grown up for picture books. Even the simplest books can talk to a child on a different level as they grow older. It doesn't help now phonics is being given so much weight as children learn to read as they are positively discouraged from looking at illustrations to help interpret the text. Hi, Charlotte. Thank you for taking the time to read the blog. Although phonics play a vital role in children learning to read, reading is so much more than that. The children who learn to read most effectively and with lasting enjoyment are those who have the widest possible reading experiences. It's shocking to me that people can be so prescriptive, and completely ignore the fact that there are many highly-intelligent people who think visually and should be catered for. The whole of modern culture is strongly visual. Sadly, not only is prescription the order of the day, but many parents are increasingly being seduced by phonics dogma and believing that the quicker their child gets ahead, the more successful they will be. I work with (and have met) so many designers working in publishing for whom school was boring on a good day and torment on a bad day, largely because our education is so print-literacy dominated. Thanks Gill - a very interesting post, and I'll order some of these for my grandson - though Rose Blanche would be too old for him - he's six, seven in August. Hi, Sue. I'm sure your grandson will enjoy Varmints and The Onion's Great Escape, and I think a grandchild is just the special person with whom to release the onion. 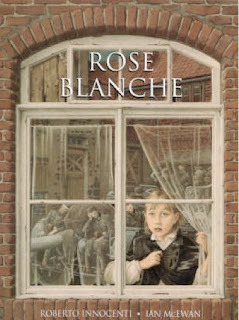 Rose Blanche is more suitable for 10-11+. The interesting thing about reading Varmints with children is how quickly they not only tell their own detailed, articulate stories, but also how effectively a beginning/middle/end story structure embeds in their thinking. I hate it when I hear a parent telling a child who has picked up a picture book 'you don't want that, that's for babies.' Even those with words can often be taken on more than one level. Thanks for highlighting the sophisticated and exciting exchanges picture books can inspire. Hi, Jane. Sometimes I feel so sorry for children in libraries and bookshops that I feel like chipping in! I think it must be partly a cultural view, as Japanese adults read manga text - and they're a highly sophisicated people. Wonderful post. Thank you, Gill. I've ordered Varmints and Rose Blanche. I've stopped feeling embarrassed about enjoying picture books, even though my children are grown up! A picture book can be more thought provoking than a best-selling novel. Perhaps part of the issue is that the older, more sophisticated picture books are still in the young children's section of the bookshop. Art galleries don't corral them in quite the same way. Maybe they need their own, separate section (like 'young adult' books). Hi, Paeony. I'm glad I'm not the only adult in a child-free home who still reads picture books! I love the idea of a separate section in bookshops - anyone out there have a route into raising this with the industry? It would certainly help to build the idea that multiliteracies are manifold strands of a complete literacy, not just precursors for small people. 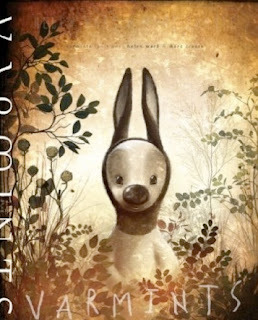 Wonderful post, and I agree that picture books are important to any reader at any age. Love them myself for all the right reasons. Thanks for sharing. I wonder, did you have words written for an illustrator to make these images so intense and important or was it a verbal discussion, outline, or topic list to get the pictures so on target for what you wanted the reader to feel. Thank you for your comment. As a teacher, I was constantly on the lookout for all kinds of books which I could use in the themed, creative curriculum for which I was part of the design team. I always used books which had already been published. I would start with the book, then decide whether it was for individual reading, for reading to the class or as a core text. If I was using a picture book as a core text, the discussion would largely be directed by the children themselves. It was a powerful experience to listen to children sharing their own feelings and asorbing the feelings of their peers into their thinking. I hope this answers your question - I wasn't sure if you were asking about my thinking in using a text, which is the answer I've given you! Thanks so much for this post. My mom was a grade school art teacher for years and loved to use picture books as inspiration for art classes for all grades. Inspired by her example, I still adore picture books and always have some on our coffee table for visitors, including grandchildren ages 7 and 10, to read. And everyone loves them! Fortunately, no one has told the grandchildren that just because they can read middle grade novels doesn't mean that they can't enjoy picture books too. Are you an artist, too? I'm fascinated by the way artists see the world around them - I am completely word dominated in the way I think, so I am always intrigued about people who interpret things in both still and moving images. Lovely post, which I will be sharing! I still remember a course where someone turned the pages of 'The Arrival' by Shaun Tan, telling us the story as they saw it. It was an incredibly moving experience, and the whole audience was in tears by the end. Illustration has a phenomenal power to provoke thought and emotion. Glad you said that Malachy. I was thinking 'Shaun Tan' all the way through this excellent post. He is clever in that he occupies an area somehow both inside and outside the picture book field. Humour gets the same treatment I find. Funny is not something a child engaged in the serious work of learning should be exposed to. I mean, the poor thing might develop an imagination, and then where would we be? Excellent post. I love listening to children. It is amazing what they come out with, when you give them time, encouragement and the respect that their ideas and thoughts deserve. I'll be on the look out for these books, too.